1 July 2009, at 9:44a.m. UK - The Monthly Scanning Surveillance Report for May 2009 from the Veterinary Laboratories Agency (VLA) highlights a case of Salmonella Pullorum that caused high mortality in chicks in a small backyard flock, and botulism in cattle and sheep associated with contact with poultry litter. Salmonella Pullorum responsible for high mortality in chicks in a small backyard flock. Four chickens were received at Winchester from a small flock with a history of respiratory disease. Purchased birds had been introduced to the flock within the last two weeks. Two of the birds showed caseous material in the upper trachea and histopathological examination of the trachea itself revealed the presence of intranuclear inclusion bodies supporting the likely diagnosis of infectious laryngotracheitis. Salmonella Pullorum phage type 17 was identified by Thirsk as the cause of high mortality among seven-day-old chicks on a small hobby farm of mixed breed chickens including Buff Orpington and other fancy breeds. A nine-month-old laying hen went “off her legs” ten days before being submitted to Luddington for necropsy. Four other hens in this small backyard flock of nine had shown similar signs in the last 12 months. Necropsy findings included numerous military foci in the liver and spleen, and 10 white masses attached to the intestinal serosa. Leucosis was suspected but histopathology demonstrated that the lesions were due to a mycobacterial infection, i.e. 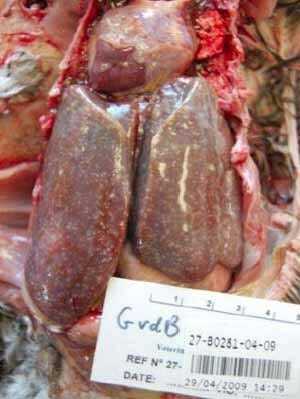 avian tuberculosis (see figure). High mortality (7.5 per cent) was reported in a batch of 55,000 11-day-old broilers. Miliary caseated white foci were seen on air sacs and in lungs, and on culture Aspergillus fumigatus was isolated from lung lesions confirming a diagnosis of mycotic pneumonia. Shavings used to bed the birds had previously yielded A. fumigatus. The carcass of an adult Muscovy duck that had been found dead was submitted to Sutton Bonnington. The duck was one of two Muscovys remaining on a smallholding animal centre. A third Muscovy had died two weeks ago but this was thought to be associated with trauma. Gross post-mortem findings were consistent with DVE and histological examination revealed typical nuclear inclusion bodies in the liver and intestine confirming the disease. Advice on epidemiology, control and vaccination was given. Two 20-month-old Simmental heifers in a group of 17 were found in lateral/sternal recumbency; six hours previously they had both appeared unremarkable and bright. After euthanasia by the veterinary surgeon, both carcasses were submitted to Luddington for necropsy. Apart from reddening of the abomasal mucosa and a few intestinal loops, there were no significant findings. However, intestinal contents tested positive for botulinum toxin type D in one heifer and the causative organism was isolated in the other heifer. The farm was next door to a broiler unit and the cattle owner had seen (and captured on his mobile phone's video) a fox dragging a poultry carcass across the grazing cattle two days previously. The incident was reported to the Food Standards Agency. A third heifer died a few days later. This is nothing new but illustrates that livestock owners are still not fully aware of the risks for ruminants associated with poultry litter.